When you see uncommon resolve displayed, whether in the news or on the big screen, you might think that the resolve stemmed from that individual facing a “do or die” moment – where some mysterious alignment of power welled up to save them. The individual suddenly rises like a phoenix and springs forth to vanquish the enemy, overcome the challenge. There is evidence for this type of spontaneous energy burst. Every once in a while you hear a story about a woman lifting a car off her pinned child, or some other herculean feat. However, I prefer that you not rely on hope for this to happen in a time of need. Rather, take action now to inoculate yourself with uncommon resolve. 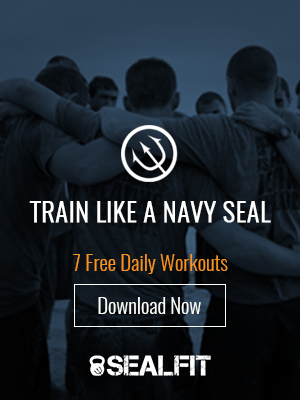 Why are there only 27 of 175 SEAL candidates remaining after four weeks of training? It is quite simple: Those 27 had inoculated themselves against failure. The other 148 went in with strong qualifications and some desire to succeed, but it wasn’t enough. They didn’t fully win in their minds before checking in to BUDS. When pressed to the wall, their foundation of resolve faltered. The question remains, then, how can you develop a level of uncommon resolve that will inoculate you against failure? How can you lean into your most important missions, projects and tasks to sail through the depths of extreme challenge? How can you navigate the choppy waters of crisis with little concern for sinking yourself? Desire: you must desire the outcome as if your hair was on fire. Belief: you must believe in your purpose, your mission, and yourself. Attitude: you must have a positive attitude, drive and be able to mobilize a team with it. Discipline: you must be willing to give up unnecessary attachments and commitments, and put in the right amount of daily effort toward your goal. Determination: you must have an unwavering commitment to finish the job, stay the course, and never, ever quit. Let’s start at the beginning and take a deeper look at desire. Desire is the base, or primary, ingredient of uncommon resolve. The other four attributes build off its foundation. If burning desire is absent, it doesn’t matter how much you believe in your mission, or how positive you are, or how disciplined and determined…you are still at risk. Some may think that determination can trump desire. But determination only has energy if it has desire to push against. Whether desire is weak or strong, determination will match it with equal measure. Consider the SEAL trainee – all go to BUDS desirous of becoming a SEAL and determined to make it. However, only those who have hair on fire, burning desire can muster the same level of intensity with the other four attributes. Combined they propel him through 300 days of the most demanding training in the military. Desire begins with an idea, a simple thought such as “gee, I want to be a SEAL.” (Substitute any wish or dream there). The first formulation of that idea in your mind plants the seed of desire. For most that seed sits there waiting to be watered, but dies as the dreamer wastes precious energy on too many other distractions. However, if that seed is nourished daily with powerful imagery and articulation in the form of a goal, it will grow from an aspirational vision into 3 dimensional reality. The seed of desire grows into a burning desire as you fix on the mental, visual, verbal and emotional representation of your goal, day in and day out. The mind fixed on a burning desire will drive out all other thoughts of lesser power. In Unbeatable Mind Academy we learn that you must win in your mind before you step into the arena. Doing so will inoculate you against failure. Have a wonderful Thanksgiving weekend – and thanks to all those serving overseas or away from their families.